I had one of those dreams this morning where you think you’re already awake and cannot convince yourself otherwise. This despite my hair changing, as I watched it, from a truly excellent Rogue streak to being shoulder-length with blunt bangs cut to an equally excellent 20′s style bob, all three styles looking fantastic on me. I was *sure* I was dreaming, to the point that I actually asked Ted (in the dream) if this was real, because I couldn’t figure out how my hair would be doing that if it was real, and then, in a fit of brilliance, I remembered that if you pinch yourself in a dream you’re supposed to wake up. Or it’s not supposed to hurt, or something, which is how you know it’s a dream. So I actually pinched myself in the dream. And it didn’t hurt particularly, except in the dream it was clear my brain said “That’s a pinch, it’s supposed to hurt, so it hurts,” so it did even though it didn’t *really*. When I eventually actually awakened, I was very, very confused, and felt vaguely as though I have been invaded by “Inception”. A few weeks ago, I created a masterpiece of modern architecture. Please note the clever use of common household materials such as straws and plastic wrap. Observe the striking use of color. Admire the organic feel of the structure. I’m so proud. I may call Kevin McCloud*. Actually, the orange tree within sprang up so fast once it had been re-potted and put into my Masterpiece of Modern Architecture that I’m going to have to build a new Masterpiece. I’m going to get some of those K’NEX thingies (they’re like Tinker Toys, only plastic) and build a much better greenhouse. I’m not quite sure what I’ll use for the plastic. 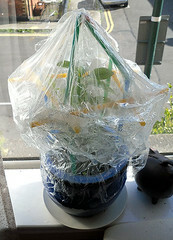 Perhaps plastic wrap again, although I’m open to better (but equally inexpensive) solutions. Um...no the joke works just fine over here. It is something I would say or my Mom would say. If you want clear plastic covers, find a REALLY big nerd. 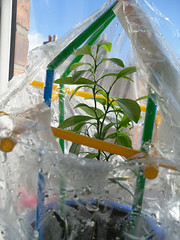 If not, get hold of a roll of transparent freezer bags(as big as possible) and a roll of clear tape. oh hey the transparencies is a good idea. I wonder if I can find those here. Maybe clear plastic book covers can be used? Not necessarily this one, though, as it's rather narrow(12"), but you get the idea. You might call a paint shop and ask if they have clear plastic used for drop cloths. Here, in CA, I'd call TAP Plastics and ask how much the yard.